Hy-Vee is known for its ever-expanding selection of steaks. But sometimes that can be intimidating. With so many options, it's easy to get overwhelmed. That's why we asked a few of our butchers and meat managers to provide their best tips for buying, storing, and cooking steak. Look for marbling and color. When selecting a steak, look for one that's well trimmed, well marbled, and has good color. If buying multiple steaks, make sure they are cut even so they all cook for the same amount of time. Cook your steak within at least 2 days. If you picked up fresh steaks, don't let them hang around in the fridge for too long. It's best to cook them within 2 days. 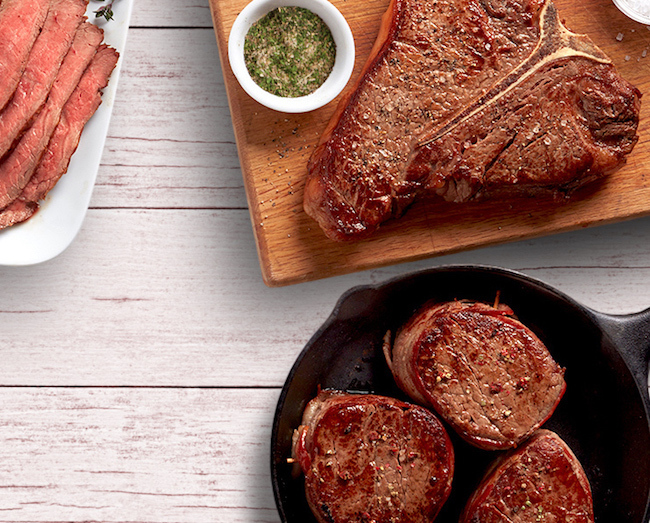 There's a difference between Hy-Vee Prime, Choice, and Angus Reserve. Hy-Vee Prime Reserve is top of the line. This is what you want if you're looking for a high-end steakhouse-quality steak. In fact, less than 8% of beef is good enough to be labeled as Hy-Vee Prime Reserve. Hy-Vee Choice Reserve is a close runner-up but more affordable. Less than 10% of USDA Choice graded beef meets the Hy-Vee standard. And it's why Hy-Vee Choice Reserve comes exclusively from the best Midwest farmers and ranchers. Hy-Vee Angus Reserve is the leanest and most affordable of the three. This is our pick for premium quality at an everyday value. The best steak on a budget is sirloin. Especially thick cut. It's great on the grill, but another option is to get a good hard sear on each side in a cast iron and finish it in the oven. Sirloin is especially tender when cooked medium rare. Use a meat thermometer and pull it from the oven when it's about 125 degrees F. It will finish cooking to 135 degrees F as it rests. Another affordable option is flat iron steak, which works great on the grill. For other cooking methods, check out 9 Ways to Cook Sirloin Steak When It's Too Cold for Grilling. In my opinion, the best budget-friendly steak is a sirloin cooked medium for tenderness, particularly a Top of Iowa sirloin, since it has less to trim. Use a cut from the plate or flank region for fajitas or steak sandwiches. Flank steak, hanger steak, and skirt steak are ideal for steak sandwiches, fajitas, nachos, stir-fry, etc. They're typically leaner and need a little marinating for about 30 minutes. They can be sliced and sautéed on high heat or left whole and grilled. Splurge on rib eye or filet mignon from time to time. If you're splurging on a nice steak, look for the Hy-Vee Prime Reserve label. It's the best. As for the type of steak, rib eye steaks are among the most flavorful, but filet mignon is the most tender. If doing a filet, it's nice to have a garlicky butter or red wine sauce to complement the meat. Let it rest for 5 to 10 minutes after cooking. Resting the meat allow the natural juices to redistribute throughout the steak, keeping it tender and juicy. During this process, it's also finishing cooking to your desired doneness. Use a meat thermometer to get the perfect cook. For steaks, here's a quick reference for temperatures. There are a lot of lean options available. If you're looking for a healthier option than, say, prime rib, just know there are tons of lean cuts of steak. The USDA defines a lean cut as one that has less than 10 grams of fat, 4.5 grams of saturated fat, and 95 milligrams of cholesterol per 3.5-ounce serving. These include eye of round steak, sirloin steak, top round steak, and bottom round steak.